'Pedagogy - Curriculum - Assessments' was the theme of first ten posts in the 'Ensuring Learning India' series. The second theme is 'Status of school education in India', where this blog would be summarizing important reports regarding this. 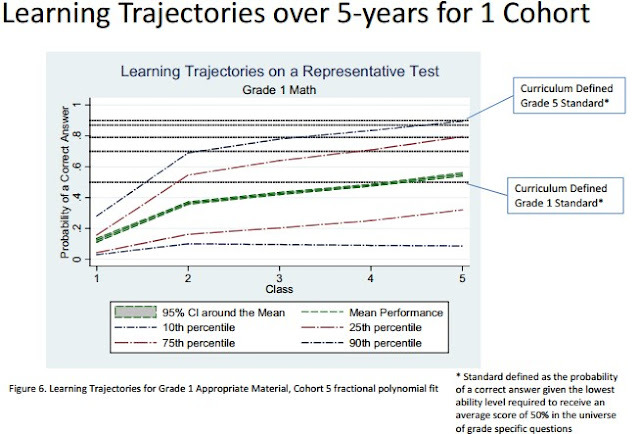 The first post in this series is about learning outcomes. 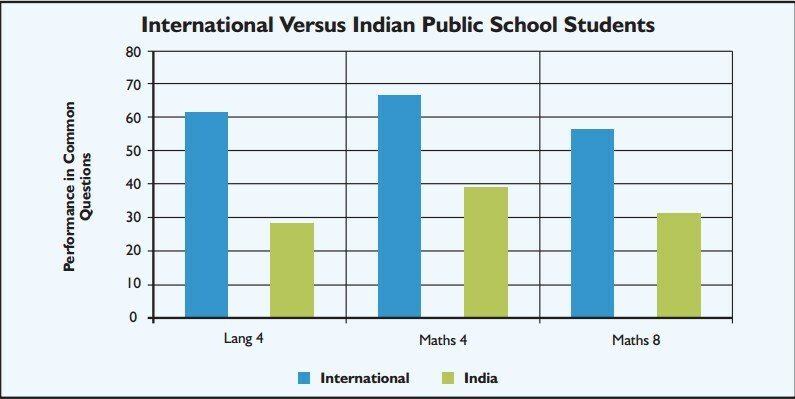 What do we know about the learning outcomes in India? It depends on the definition of learning outcomes, the design of question papers and the methodology of implementation - sample population or census and if sample population, the methodology of sampling. There are 8 different studies or surveys on learning outcomes in India. This post summarizes important findings from all these. 1) Annual Status of Education Report (ASER): ASER is the widely known report regarding learning outcomes. The questions in this survey test basic math and language skills. Questions available here. This is done in a sample set of villages and not in urban India. Children are surveyed at home, and not at school. It means that this consists of students going to private schools, government schools and even those who dropped out. It is not necessary that same children are surveyed every year. 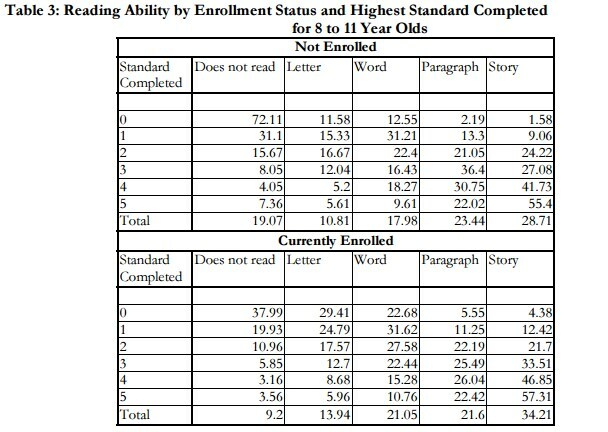 On reading: "in Std III, only a fourth of all children can read a Std II text fluently. This number rises to just under half in Std V. Even in Std VIII, close to 75% children can read Std II level text (which implies that 25% still cannot)." In 2012, 26.3% of Std III children could do a two digit subtraction. This number is at 25.3% in 2014. For Std V children, the ability to do division has increased slightly from 24.8% in 2012 to 26.1% in 2014. There are other trends which are quite worrying. For example, the percentage of children in Std II who still cannot recognize numbers up to 9 has increased over time, from 11.3% in 2009 to 19.5% in 2014. Similarly, the ability to do division among Std VIII students has been dropping since 2010. The proportion of Std VIII students who could correctly do a three digit by one digit division problem was 68.3% in 2010. This number has dropped to 44.1% in 2014. 2) Longitudinal tracking of students: Prof. Karthik Muralidharan et al. tracked a sample of students for 5 years, through out their primary school. Students would be taking a different test every year. These are adjusted using Item Response Theory. 40,000 data points are collected over 5 years. The following graph shows the trajectory of students, in reference to grade 1 and grade 5 learning level. Some key insights from the above graph. At 5th grade, only 60% of the students are of the level of grade 1 (green line). 90% of students are below grade level in 5th grade. 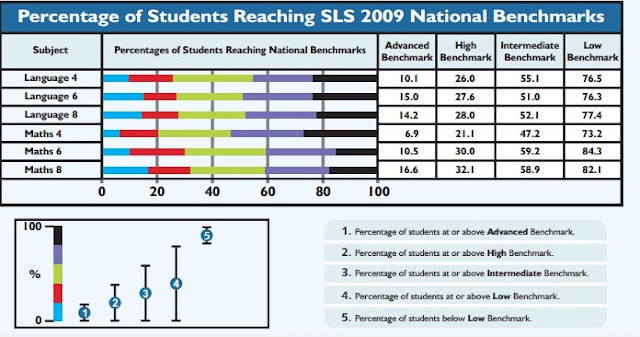 The bottom 10 percentile of the students are always way below their lower grade level. The results of second round (2006-07) of older children, 12 years by then are as below. 4) Indian Human Development Survey: Indian Human Development Survey (IHDS) was conducted by researchers from University of Maryland. First round was conducted in 2005-06 in a nationally representative sample of 41,554 households, 1503 villages and 971 urban neighbourhoods. The second round was conducted in 2011-12. Learning outcomes were also part of this survey, the tools of which were designed in partnership with Pratham. The summary statistics of the results are as follows. Please find the working paper on learning outcomes based on 2005-06 data here. 5) National Achievement Survey: National Achievement Survey (NAS) is conducted by NCERT every three years for different grade levels. 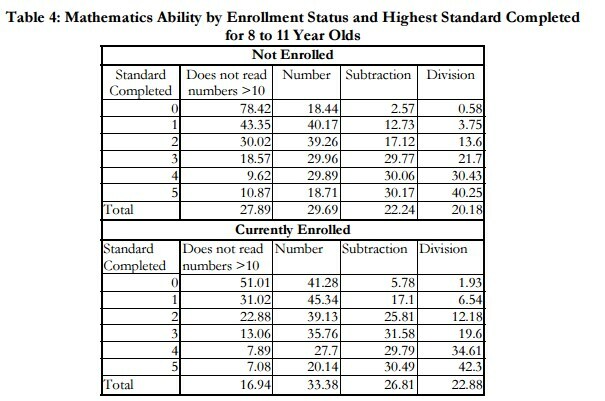 The results of grade 3 show that good percentage of students can do addition (69%), subtraction (65%) and other operations. Grade 5 results show that there is no significant difference between scores of rural and urban students. There are debates on ASER vs. NAS results. The comparison can be found here. 6) Student Learning Study: Student Learning Study was conducted by Educational Initiatives Pvt. Ltd in 18 states of India and 1 UT, in partnership with Google and the state governments. Students of grade 4,6 and 8 were tested in language and mathematics. This study benchmarked students' performance. It also compared performance on common questions with international assessments. 7) State level learning assessments: State governments get external assessments done in the government owned schools. For example - Bihar, Himachal Pradesh. The assessment in Bihar is a census assessment where all students going to government school of grades 3,5 and 7 were tested. Please check the report for detailed results. The results for grade 3 are shown below, where 15 lakh+ students were tested. 8) Quality Education Study: Quality Education Study was conducted by Educational Initiatives Pvt. Ltd, an Ahmedabad based company in partnership with Wipro. Unlike the other assessments which were primarily conducted in government schools and rural areas, this study conducted assessments in 89 elite private schools in the country and tested higher skills unlike assessments like ASER which test basic skills. "This study was conducted across all the five metro cities in India New Delhi, Mumbai, Kolkata, Chennai and Bengaluru. Overall, about 23,000 students, 790 teachers and 54 Principals from 89 schools participated in the study including 6 schools recommended by experts as schools providing different learning environments." The important finding of this study is that "Students in the Top schools of our country exhibit rote learning. 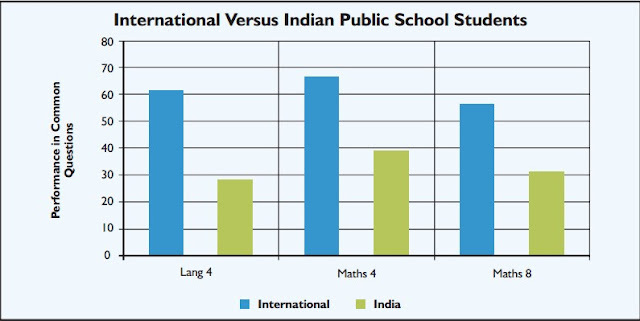 Performance of class 4 found to be below international average (compared with PISA). 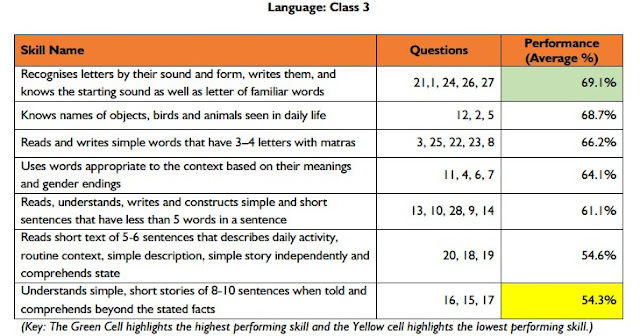 Students seem to perform on par with international average in class 8, mainly due to their higher achievement in procedural questions (i.e., questions that require straightforward use of techniques or learnt procedures to arrive at the answers)." Note: Learning outcomes doesn't have a standardized definition. The results of studies can depend on the skills tested, quality of questions, design of the question paper and methodology of sample section. One must look at all learning assessments with this at the back of the mind. In most, cases, instead of looking at average performance in subjects, it is useful to check skill wise performance which can be relatively compared better with other studies.